What are Ductless Ceiling Split Air Conditioner? The name itself, ductless means you do not need any duct work for such type units. Traditionally ductless systems used to come with wall mounted units, but in lot of application there may not be enough room on the wall for air handler. Which is where the ceiling mounted air handlers come in play. Like other ductless models, a ceiling cassette consists of two parts, an outdoor condensing unit and an indoor air handler connected by refrigerant and electrical lines that run through a 3" opening in an exterior wall. This system requires a licensed HVAC technician to connect the lines between the indoor and outdoor components. What are the different types of ductless ceiling split systems? 3. Concealed Duct Air Handlers. What is a ceiling cassette air conditioner? How does it look? Extremely discreet, with only the grill showing in the ceiling. Homeowners who prefer not to see the indoor air handler and have at least 9 ¼" above-ceiling clearance should consider a ceiling cassette. 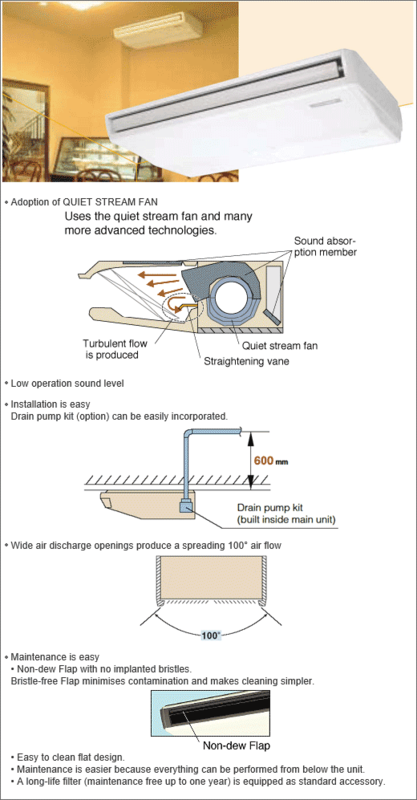 Latest fan technology distributes the conditioned air evenly throughout the room. Ceiling cassette systems provide both heating and cooling and are popular in commercial applications such as offices, conference rooms, restaurants, night clubs and bars, as well as new construction condominiums and homes. Through new, advanced technology, Inverter air conditioners are more economical to operate and quieter to run than conventional units. They can handle greater extremes in temperature, are smoother and more stable in operation, and reach the desired temperature faster than conventional air conditioners. The airflow direction, up or down is set automatically to match the operating mode, down for heating, up for cooling. This mechanism enables the cassette body to move 1-3/8" downward into the room to allow for limited ceiling space. No special work or accessories are needed. Airflow in all directions maintains an even temperature throughout a space, perfect for corner installations or in long hallways. - Set different temperatures throughout the day. How much does a ductless system cost? What is ceiling suspended ductless system? How does it work? If you’re cooling a large room with a high ceiling and less than 9 ¼" above-ceiling clearance, a ceiling suspended model is your best option. Ideal for great rooms, workshops, additions and garage conversions, ceiling suspended models are also an excellent choice when a wall mount isn’t possible. The indoor air handler measures 65 ?" wide x 9 ½" high x 27 ½" deep and can be positioned anywhere on the ceiling for maximum effectiveness. 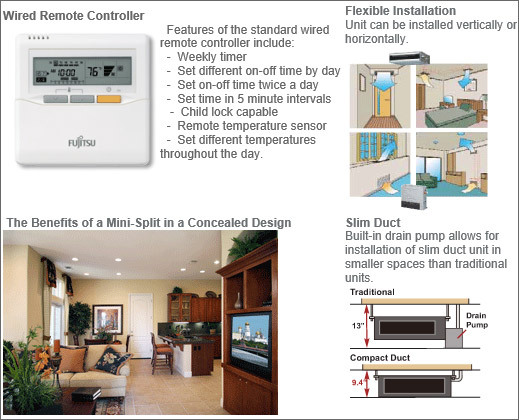 The included remote control makes operation easy no matter where you place the unit; you also can wire the unit to an optional wall controller. Larger capacity ceiling-mounted system are elegant in design, quiet in operation and yet still pack a mighty cooling and heating punch. With four speed settings and auto air-speed adjustment it is ideal for both large and small areas. Through new, advanced technology, Inverter air conditioners are more economical to operate and quieter to run than conventional units. They can handle greater extremes in temperature, are smoother and more stable in operation, and reach the desired temperature more quickly than conventional air conditioners. Airflow is automatically redirected left, right, up and down to provide a consistent temperature throughout a room. When the system is initially turned on, the fan speed is HIGH to reach the set temperature as quickly as possible. The fan speed will automatically adjust downward as the room begins to reach the set temperature. This system features Dry Mode, which helps to control humidity levels, even when cooling may not be needed. Outside air can be introduced by attaching field supplied flexible duct to fresh air knockouts. In addition to the conventional 4-speed setting, our suspended units are now equipped with an automatic air-speed adjustment mode. This setting automatically adjusts the air speed to match the room environment. At the start of heating or cooling operation, the airflow is set to high-speed to quickly heat or cool the room. When the room temperature reaches your desired setting, the airflow speed is decreased automatically for stable comfortable heating or cooling operation. Units are equipped with high and low ceiling operation modes that make it possible to switch the airflow volume to match room height. The ability to choose the optimum airflow volume makes it possible to optimise the breezy sensation felt throughout the room. 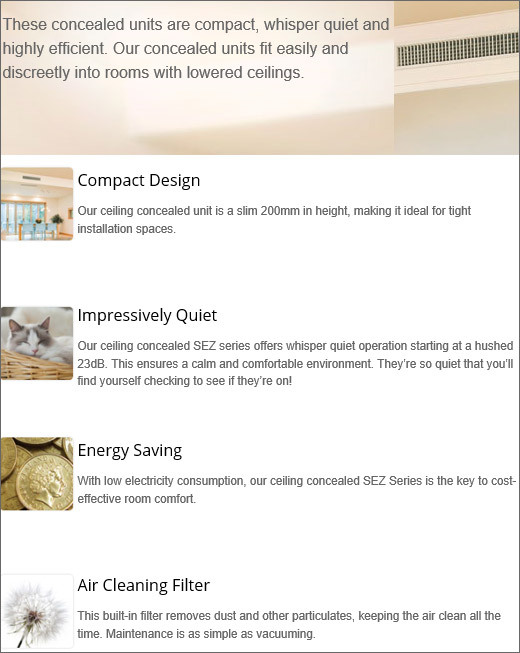 What is ceiling concealed duct system? How does it work? Concealed ducts are mainly used where two adjacent rooms are smaller and need a common air handler. This concealed duct system can be divided into two (see figure below) and can be used for scenerios like Master Bedroom and Bathroom for exmaple or Living room and Dinning Area. Concealed ducts provide comfort cooling or heating for small room applications. Features include high efficiency up to 21.5 SEER, heating at low temperatures down to -5ºF, compact design, quiet operation, a standard wired remote control, and the ability to bring in fresh air. Heating capacity at low outdoor temperatures is achieved by adopting a large heat exchanger and a high capacity compressor. Systems operate down to -5ºF. How much does a ductless ceiling system cost to install? The average cost of an installing ductless ceiling systems with indoor heating/cooling zone is between $15,00 and $5,000 depending upon if you have a single or multi zone system. Additional heating zones and greater heating capacities will increase the cost of the system. Other factors that will affect the cost of an installed system include manufacturer and model, refrigerant line-set length, difficulty of installation, and contractor rates.